The winter season has set inn and now its time to update your wardrobe according to the demand of the season. Apart from winter outfits like shrugs, blazers, sweaters, tops etc you also need to wear the best foot wear of this winter. Women’s classic short boots are in trend this winter. These are very comfortable and warm to wear. You can wear short boots with jeans and all type of winter outfits and can make you look stylish at the same time. Winter shoes with high heels looks chic too but some women do not feel comfortable in high heels-they need to wear the short boots that are in trend too. A variety of short boots is available so that you can grab the one that compliments your outfit. The color and stuff also varies according to the demand. Here are some classic short boots mentioned below for you to make your choice for this winter. The first in list of short boots are the flat boots that comes up in different styles and colors. There is not a big variety of colors in flat boots but the black and brown looks classic all the way. You can wear flat boots if you’re tired of sky high heels. They are very much comfortable and look chic at the same time. If you wear these boots with jeans then it will definitely adds to your personality. Flat boots usually come up in leather stuff that is durable to wear. You winter will we awesome if you would wear the flat boots of different styles. If you’re not willing to wear the flat boots then you can opt for the middle heel boots. They have the same characteristics as the flat boots have, except the heel. Short heighten women can wear the middle heel boots to groom up their personality. These boots are available in different styles like if you want to wear the boots having buckle on them, or you want the boots having zip on their side. Velvet stuff is also available in these boots. The styles are totally amazing and beautiful that can make your winter stylish and trendy. These boots are totally adorable and looks very much chic to wear. If you are about to attend the wedding ceremonies in winter season then you can wear the boots trimmed with fur. It will give your foot an un-traditional look and you will be look stylish according to the demand. These boots are not like traditional office wear or college boots but they are different and unique to wear. In the talk of winter footwear, ankle boots could not be neglected. These are the most preferable boots by the ladies and they are comfortable too. 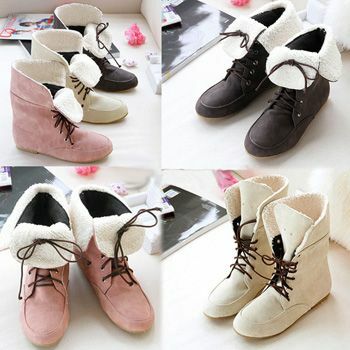 Ankle boots come up in various splendid styles and designs. Different shoes brands have a huge collection so that you can select according to your outfit. Some of the designs contain beds and stones that are totally a new trend in ankle boots. Pumps are versatile foot wear that are very much famous these days. They have a number of qualities that make them the best footwear for every season. In winter, you can grab the best flat pumps for you to wear. They are of different colors and styles in low heels. Whether you are wearing jeans or long shirt, you can wear them without any hesitation. Pumps with buckles are also popular these days. Some pumps have a big flower on them that gives a fresh look in the dull and cold winter. These are not considered as boots but you can wear them in winter with a pair of socks due to their versatility. These were the boots that are popular this winter. You can make your choice from the above mentioned styles. So just go and buy the boots for making your winter the best one.